To be honest, I love this Airtel smart Premier tariff plan! Airtel smartPremier is a tariff plan you too are bound to fall in love with if you are an international caller. 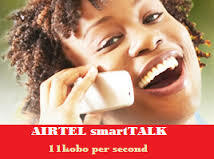 The reason for this is that it allows you to make both local and international calls at the rate of 11 kobo per second. Imagine that! You will be charged 40 kobo per second for 1st one minute of the day only. Thereafter, you continue to pay 11k/sec to call any network in Nigeria. The charge is the same for international calls to all the United Kingdom landlines. Apart from that, calls to the United States, India, Canada, China and India cost the same. Calls to South Africa also qualify for this tariff, but with some conditions attached. Airtel smartPREMIER affords you the opportunity to receive calls for free while roaming. Believe it or not; you have up to about 500 minutes to receive freely in a month. Just try it. Apart from being able to make calls at a flat rate of 11k per second, you will also enjoy free data bonuses on every recharge. The minimum data bonus is 5MB and this is for the recharge of between ₦100 and ₦198. The higher the value of your recharge, the more your data bonus. For instance, if you recharge up to ₦1000 at once, you will get up to 150MB. Hey, all of you post-paid subscribers and those with staff prepaid lines, this is not for you. So steer clear and try other tariffs. Are you beginning to fall for this plan? The code to dial is *318# and you become the Airtel premier for free. But wait a minute. While you enjoy free portability, be informed that’s only for the first migration in a month. If you have to migrate subsequently in the same month, be prepared to part with ₦100. And if you want to opt out of the plan, simply dial the code of the plan you want to migrate to and you are out at once.